I love Argentinean food and all of the great herbs they infuse in their marinades. This incredible grilled chicken recipe is a perfect example. I’m a big fan of chicken on the BBQ, and this marinade is so fragrant and flavourful that it really steals the show. You’ll also feel a lot better about making your marinade using fresh ingredients rather than pouring it out of a bottle. Open-faced burgers with a twist! Using medium ground beef I handmade some very thin hamburgers. I then put a large handful of chopped smoked meat on the beef and topped with another thin hamburger, pinching to seal the two patties together. Lastly I sprinkled on some Montreal Steak spice, just to seal the deal. The burgers were served up on a slice of sour dough bread with the mushroom gravy recipe below. The dish worked out perfectly – homemade hamburgers are a crowd pleaser any day – with a smoked meat filling and mushroom gravy… delectable! Chimichurri is a wonderfully aromatic Argentinian sauce that is often used as a marinade or served alongside grilled beef. I prefer the latter as I find it perfectly accompanies the steak without masking the steak itself. The recipe below is just one variation of chimichurri, I love that this one uses a combination of aromatic herbs to tempt the palate. This dish below is such a simple one to throw together, but as we roll into summer, it becomes a welcome change from standard dogs on the grill. The sweet & tangy onions paired with the spiciness of the sausage is a marriage made in heaven. If you aren’t a big cilantro fan, try replacing with some Italian flat leaf parsley. Dads, this Mother’s Day turn the table on mom… the kitchen table! It’s time to rally the troops and create a feast she will never forget! And this year, instead of the usual recipes prepared by moms, for moms, I'm here to lead the way, and share some of my best recipes and tips. It IS possible for Dads and children to combine forces in the kitchen to create Mother’s Day magic—I've been doing it for years! 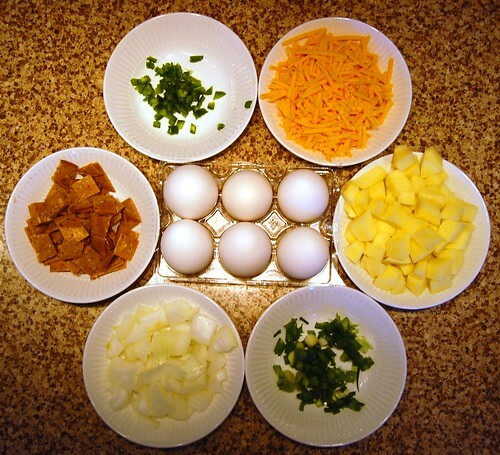 This tasty omelet is not just for breakfast! While it’s not every day I have the time to cook anything fancy at breakfast, sometimes Sundays afford me the luxury of brunch at home. This recipe is really tasty and if you’re having company it’s impressive AND easy to make. I love this recipe for a number of reasons but most of all it's because it is so simple to make. The crisp, bright green asparagus adds great contrast in both texture and colour. The mushroom-cheese sauce pools just perfectly in the pasta shells, creating little flavour pockets that burst every time you eat another mouthful. The pepperiness of the Boursin cheese reminds you that this isn’t your kids’ mac ‘n cheese—but still wraps you in the warm blanket that only comfort food can provide. Hidden Valley Ranch recently introduced some new flavours into their already popular lineup of Ranch dressings. I had a chance to test out their Classic Cheese Ranch and Spicy Ranch dressings at home this week. With its natural setting bordered by Lake Okanagan and a majestic mountain backdrop, there are few places in Canada that can compete with the sheer beauty of Kelowna, British Columbia. It does not take visitors long to realize why so many NHL players call this oasis home during the off-season. With a multitude of activities Kelowna has always been a hotspot for the outdoor tourist: cycling, golfing, skiing, hiking, fishing abound. A Passover Cake Good Enough To Eat All Year Long! When my mother-in-law asked me to make a dessert for her Passover seder, I had my work cut out for me. First off, as you likely know, you can’t use flour to make anything on Passover. In addition, I don’t really have much of a sweet tooth to begin with. Sure, there are some desserts I love—homemade strawberry shortcake, cheesecake, lemon meringue pie…but this is Passover, people. So, after hunting around and making some modifications, I landed on the recipe below. It turned out really great and everyone loved it! A Passover-friendly recipe, for those of you seeking inspiration this week. This flavourful dish pairs a richly flavoured roast with a great twist on spuds. There's nothing I enjoy quite as much as a challenge on the grill. When I was asked to come up with a grilled version of the classic breaded chicken finger I certainly had my work cut out for. It's hard to compete with a deep-fried favourite that children love to devour. Luckily, not only is this a healthier way to prepare chicken fingers, it turns out all three of my kids loved them! They have great flavour, a great crunch and when dipped into the dipping sauce are just undeniably delicious. These super-delicious cupcakes are sure to be a hit on St. Patrick's Day whether you taking them to work, or serve them up to eat at home. The moist chocolate cake is not too sweet and is perfectly enhanced with a touch of Guinness. Paired perfectly with cream cheese frosting, it's hard not to eat the whole lot at one time. Topping them with some St. Patrick's Day themed decorations really puts the cuteness factor over the top. I'll be honest, when I was asked to review McCain's latest entry into the frozen vegetable aisle I was super skeptical. I've always had a problem with vegetables from the freezer. Not in a 'oh-my-gosh I'm SO above eating anything that's not fresh' kind of way but, really, it's just that I've just never enjoyed them. I have been served many a stir-fried rice ruined with frozen peas and corn, insulted by restaurants who serve freezer-burned carrots, terrorized by mushy piles of defrosted broccoli. As I said, skeptical. a destination that proudly boasts itself as "Canada's Favourite Family Resort"
With its lush landscape and serine lake dotted with cottages and boat ports, the Okanagan Valley is almost perfectly contrasted with the stark mountains that rise around it. High up into the surreal rocky and snow covered terrain, about an hour drive from Kelowna is the Big White Ski Resort—a destination that proudly boasts itself as "Canada's Favourite Family Resort." A lofty declaration considering the number of ski resorts the province alone contains. As wallets have tightened over the last several years, there is fierce competition for vacation dollars. Anyone can invite over some friends, bake some cookies, turn on the TV and call it an Oscars party. But if you're gonna do it—you might as well do it right. Throw a party they'll be talking about from now until next year's awards. By honouring each of this year's Best Picture nominations with a pizza pie you'll bowl over your party guests. The wonderful thing with pizza is you can make it as simple or complex as you'd like. Order the whole thing from a delivery joint, or make it from scratch at home—the choice is yours. You Say Brrrr..I say Brrr-illiant! With the mild weather we've been having this year, a trip to Ottawa for a healthy does of winter is just what the doctor ordered. For the Family Day long weekend the YummyMummyClub and their families will be descending on Ottawa for their annual get-together in the nation's capital. Early on in a relationship it's not difficult to sweep your significant other off his or her feet with the simplest of acts. A box of chocolates, a bouquet of flowers, a text message, a playlist, a romantic stare across a crowded room. However, as you move on into the normalcy of everyday life it gets harder and harder to rekindle that passion that was once so abound. Is there anything better than going through your day knowing dinner is taken care of and cooking in the slow cooker? I add the hot sauce in as a garnish so it's not too spicy for the kids but I can ratchet up the heat for the adults. A delicious and filling appetizer or main that's ready for dinner whenever you are—what more can you ask for from a recipe? Any recipe that has me toss all the ingredients into one pot and then gets devoured by my kids is an instant winner. These chicken wings are so simple to make and their sweet and tangy sauce will certainly win your crew over as well. My kids like their wings a bit crispy, so I'll usually toss them in a roasting pan under the broiler for 15 minutes before serving—but they're just as delicious right out of the pot.